To “unwrap” or not to “unwrap”? – Actually, there is no question. In addition to the voluminous numbers of standards teachers must impart to their students each year, there is the added challenge of really understanding what the standards means. It’s one thing to read a standard and get a general sense of what it’s about. It’s another thing to thoroughly understand what it explicitly and implicitly indicates. What is it that students must know and be able to do as stated in each of these learning outcomes? “Unwrapping” is a simple method that all teachers in all grade levels can use to deconstruct the wording of any standard in order to know its meaning inside and out. Why is this important? If teachers aren’t crystal clear about the full and precise intent of a given standard, how can they accurately teach it? How can they accurately assess student understanding of it? How can they clearly communicate to students the specific learning intentions for a unit of study? Answer: Without first analyzing the standard, they can’t. 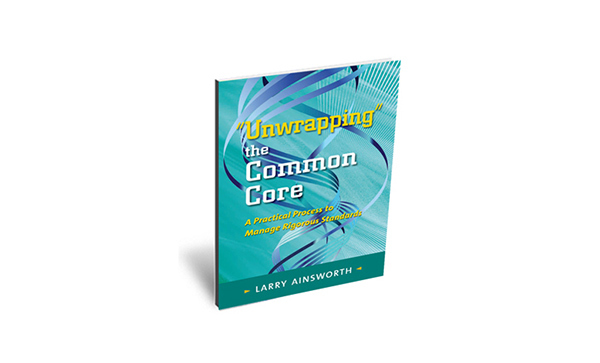 “Unwrapping” the Priority Standards (those standards pre-determined by teachers to require the greatest emphasis) is the very first step in planning effective instruction and assessment. Working alone or with colleagues, teachers examine each Priority Standard within a particular unit of study. They underline the teachable concepts (important nouns and noun phrases) and circle or CAPITALIZE the skills (verbs) that students are to demonstrate. Some of these concepts and skills represent surface or concrete learning (lower-level foundational knowledge and procedures); others represent deeper or abstract understanding (higher-level insights and applications). Together, these “unwrapped” concepts and skills represent what students are to know and be able to do by the end of the unit of study. RI.6.6: DETERMINE an author’s point of view or purpose in a text and EXPLAIN how it is conveyed in the text. 2.NBT.9: EXPLAIN WHY addition and subtraction strategies work, USING place value and the properties of operations. In both of these examples, the key concepts (nouns and noun phrases) that students must learn have been underlined, and the specific skills (verbs) that student must demonstrate appear in CAPS. This same process would then be repeated with the three or four other Priority Standards assigned to these ELA and math units of study, respectively. The majority of educators I’ve worked with prefer using a three-column chart in which the concepts are listed in the first column, the skills in the second column, and the levels of rigor in the third. In this way, they can see “at a glance” all of the learning targets and corresponding levels of cognitive rigor that will be the focus for instruction and assessment during the unit. In addition, the concepts listed in the first column provide many of the unit’s vocabulary terms. Transferring the underlined concepts and capitalized skills from the standards document to the graphic organizer may appear to be mere “word shuffling,” but it is much more than that. Even though the first task is to separate concepts from skills, the two remain tightly connected. It is the reorganization of the concepts and skills into this visual format that enables teachers to grasp a standard’s precise meaning and to determine its degree of cognitive challenge. The assigning of approximate Bloom’s and DOK levels to the concept-skill pairs on the graphic organizer is a mentally stimulating (and sometimes challenging!) exercise, but one that teachers find extremely valuable. While working through the process, trust your professional judgment, and let yourself practice deciding these levels. Collaborate with grade-level or course-level colleagues whenever possible, and “agree to disagree” while you are deciding the levels. Keep in mind that you can always revisit and revise your initial decisions later—usually during the drafting of assessment items. You are then zeroing in on what the “unwrapped” concept and skill are calling for so you can write an assessment question that closely matches. Identify three or four Priority Standards as the focus for an upcoming unit of study. “Unwrap” each Priority Standard by underlining its key concepts (nouns and noun phrases representing what students need to know) and circling or CAPITALIZING the skills (verbs representing what students need to demonstrate). Create a graphic organizer that includes all of the “unwrapped” concepts and skills. Assign an approximate Bloom’s and DOK skill level to each concept-skill pair. A highly recommended resource for this step is a set of matrices created by Karin Hess, available online at http://static.pdesas.org/content/documents/M1-Slide_22_DOK_Hess_Cognitive_Rigor.pdf Whereas this document applies specifically to math and social studies, a separate document is available that applies to math and science. When finished, double check that every concept and skill in the “unwrapped” Priority Standards appears on your graphic organizer. In this way, you can confidently set aside the standards documents and plan your unit of study directly aligned to your targeted Priority Standards. In addition to the two initial “unwrapping” steps presented here, the full process also includes the identification of Big Ideas and Essential Questions. Derived from the “unwrapped” Priority Standards, Big Ideas are the key understandings, the “aha’s” or “take aways” you want the students to discover on their own by the end of the unit of study. Teachers pose open-ended Essential Questions at the beginning of the unit to engage students to discover for themselves the related Big Ideas. In a subsequent blog post, I will describe and illustrate how to derive the Big Ideas and Essential Questions from the “unwrapped” Priority Standards.